Many of you may be wondering why IFTLE has recently been paying so much attention to the Apple A6 processor. Well, TechInsights reports that in the last 5 years Apple has generated over $150 billion in revenue from the iPhone family of handsets and accessories, and over 100 million units of the iPhone have been purchased by consumers [link]. Since the introduction of the iPhone in 2007, there have been five generations of iPhone models, each one improving on the technology used for the preceding model. Apple has partnered with Samsung for every generation of their application processors but recent Apple-Samsung lawsuits over patents related to competing handsets has lent credence to the rumors that Apple was going to switch production to TSMC. What we now find is that this first generation of the A6 is still manufactured by Samsung as confirmed by both TechInsights [link] ("Our initial SEM cross-sections of the A6 processor show metal and dielectric layering that is almost identical to that used in the previous A5 processor … Early analysis of the die markings of the A6 reveal markings that are similar to the Samsung markings found in the A4 and A5 processors") and Chipworks [link] ("What we can say is that the foundry for the chip we have analyzed is confirmed to be Samsung and that [...] this chip has a custom designed ARM core [...] and has a triple core graphics processor unit"). Thus, multiple trusted sources agree that the A6 looks like it is being manufactured by Samsung 32nm technology. 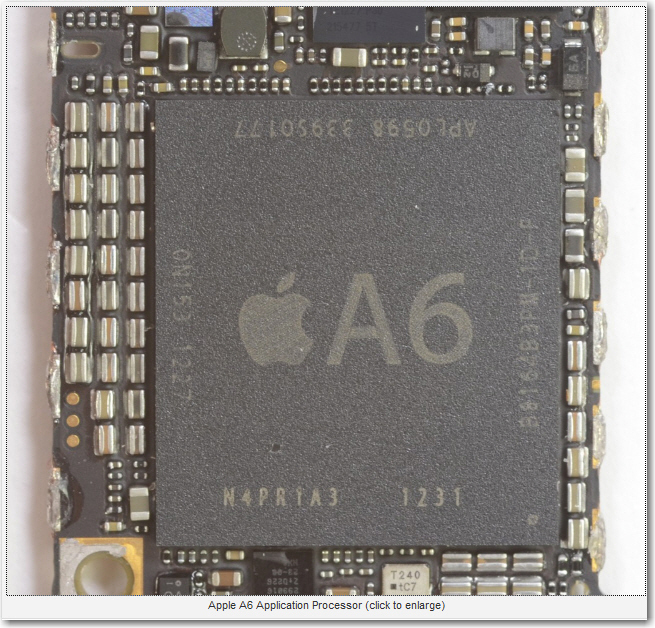 The A6 is also the first Apple processor to use its own ARMv7 based processor design. 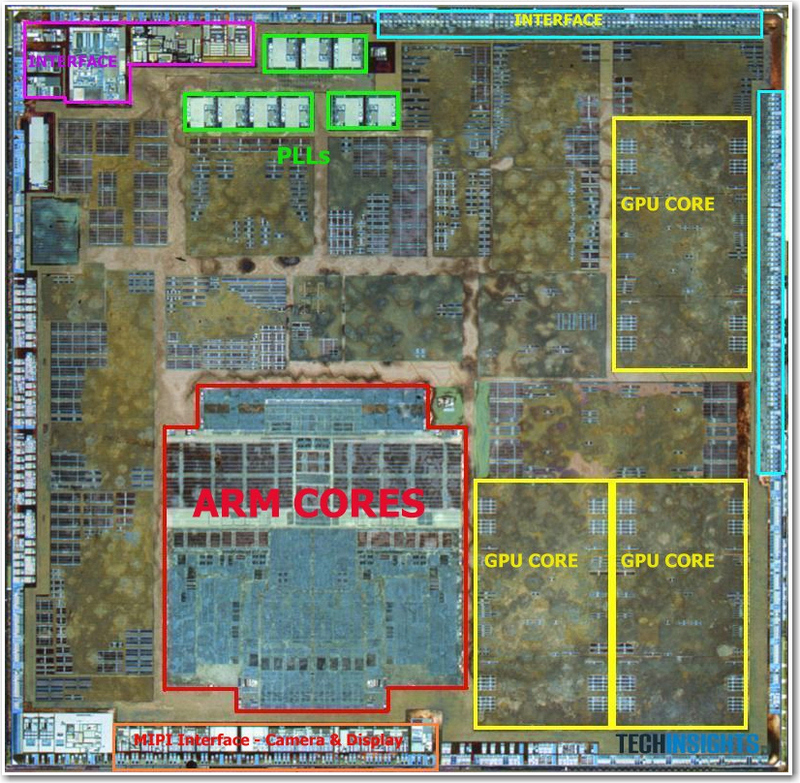 The CPU cores aren’t based on the A9 or A15 design from ARM IP, but instead are something of Apple’s own design [link]. This information makes complete sense vs. the recent announcements indicating that TSMC was scaling up in 2013 (obviously not ready for last week’s production release). IFTLE concludes that it is likely that the 2nd-gen A6 will be done in 28nm technology by TSMC similar to the 45nm and 32nm versions of the A5 (as shown in the table above), and this is the point of entry for the TSMC 2.5D technology. The timing for this appears to be 2013. What Apple product will be the point of entry? IFTLE will stay on top of this evolving technology story. Well, no sooner did we upload the blog last week [see IFTLE 114, "28nm capacity, nickels, and a symbiotic relationship"] than a local reader brought to my attention that the "Samsung pays off Apple in nickels" story was shown to be a hoax [link]. Even though my link was to Google-Nexus, not some crazy blogger with no credibility, I should have known better. I guess part of me simply wanted it to be true …. what a great move it would have been! Kind of like Clint Eastwood telling off the President of the United States. I asked the question, how and where do you get 20B in nickels? [Much less the logistical trouble of transporting 20B nickels weighing in excess of 100,000 tons.] So I should have followed my gut, or at least ran this by my BS meter! I guess I’m not any smarter than those who have spent the last 4 years "hoping for change" (pun intended) but never got it. So I guess the only lesson we learned here is: Don’t believe everything you read. STATS ChipPAC (SCP) has announced that its "TSV capabilities have achieved a new milestone with the qualification of its 300mm mid-end manufacturing operation and transition to low-volume manufacturing." [link] Reportedly SCP is engaged with multiple strategic customers on TSV development programs for the mobile, wireless connectivity, and networking market segments. Qualification activities include devices at the 28nm silicon node, application processors (AP), and graphic processors utilizing TSV for the high-performance wide-input/output (Wide I/O) memory interface required by higher-bandwidth applications for the mobile market. The Company’s BEOL services include chip-to-chip and chip-to-wafer assembly with stealth dicing and fine pitch micro-bump bonding down to 40Î¼m. Dr. BJ Han, executive vice president and chief technology officer, indicates that their "primary focus has been to develop high-volume TSV technology capabilities that we can offer to customers at cost points that make TSV a viable solution. We now have mid-end manufacturing capacity in place in Singapore and are actively engaged with multiple strategic customers on the production qualification of 2.5D and 3D packaging designs." "3D IC commercialization to take place in 2015-16"
Tong points to the fact that "electronic design automation (EDA) tools are not yet mature enough for the industry’s transition to 3D ICs from 2D ICs." When they finally do happen, Tong sees a broad array of applications including consumer electronics, mobile communications, PC, and automotive. The emergence of cloud computing is also expected to help accelerate the adoption of 2.5D and 3D TSV chips, he believes. IFTLE 114: 28nm capacity nickels, and a "symbiotic relationship"
While Nvidia is the only customer to complain about poor 28nm yields at TSMC [link], other customers like Qualcomm and Altera have reported that "constrained supplies of 28nm" has affected their sales figures. Circulating rumors suggest that Qualcomm has looked for 28nm capacity at UMC and GF but has returned to TSMC since things were even worse at its competitors. TSMC has announced a goal of getting its 28nm supply and demand into balance by the end of this year. According to the Taiwan Economic News, TSMC’s 28nm capacity is now running at 100,000 wafers a month, up from the 25,000 wafers a month capacity in Q2. TSMC’s fab 15 in the Central Taiwan Science Park is said to be ending Q3 with 69,000 28nm wafer per month capacity and will expand that to 135,000 wpm in Q4. While there were widespread reports earlier in the year of severe 28nm yield issues at TSMC [link] according to Taiwan’s Commercial Times, equipment suppliers are reporting that TSMC’s 28nm yield is now over 80%. But capacity shortage appears real and may constrain smartphone launches……. At a recent investment conference, Qualcomm, maker of baseband chips and application processors (like Snapdragon) for smartphones and tablets, reported that it has had trouble meeting customer demand and is trying to ramp the supply as quickly as possible. Would financial partners get better access to the available capacity? Bloomberg reports that Apple and Qualcomm have made investment offers of more than $1B each, in order to set aside production capacity exclusively for them — but have been rebuffed by TSMC [link]. The report said that Apple’s proposal was aimed at securing an alternative supplier to Samsung for chips for its iPhones and iPads, while Qualcomm, leading supplier of application processors to the rival Android platform, needs to boost supply as shortages have impacted its earnings. While TSMC refused to respond to what it called "market speculation," CFO Laura Ho did say that that "Dedicating one facility to a single product or customer creates the risk of a fabrication plant becoming a burden if the product, client or technology changes….You have to be careful. Once that product migrates, what are you going to do with that dedicated fab?" The Bloomberg report says the smartphone chip market that is worth US$219.1 billion worldwide. At present Apple relies on Samsung for its leading-edge A5 processor — but we all know about the high-profile legal dispute with Samsung over smartphones patents, and how Apple has been reported to be working with TSMC (Hsinchu, Taiwan) to bring up a 28nm A6 processor. Apple may have won the recent Samsung suit concerning smartphones, but it appears that the joke was on them! [link] Google / Nexus reports that 30 trucks arrived at Apple’s headquarters in California to pay the required fine. Minutes later, Apple CEO Tim Cook received a call from Samsung indicating that over the next week they would be paying the $1 billion dollar fine in nickels. Do the math: this is 20 billion nickels. Lee Kun-hee, Chairman of Samsung Electronics, told the media that his company is not going to be intimidated by a group of "geeks with style" and that if they want to play dirty, they [Samsung] also know how to do it. "They can use the coins to buy refreshments at the little [vending] machine for life, or melt the coins to make computers, that’s not my problem, I paid them and fulfilled the law." IFTLE wants to know: (1) where Samsung was able to come up with 20B nickels ?? And (2) will Apple will use the nickels to pay for the next delivery of A5 chips?? The Taipei Times now reports that ASE is "brushing off concerns" of a potential rivalry with TSMC amid reports that the world’s largest foundry has put together a large team to make further inroads into ASE’s bread-and-butter market. They quote a senior ASE executive saying that "…the company hopes to have a symbiotic relationship with TSMC" in the future. The traditional definition of symbiosis is "a mutually beneficial relationship involving close physical contact between two organisms that aren’t the same species," like birds eating insects of the back of a rhino. 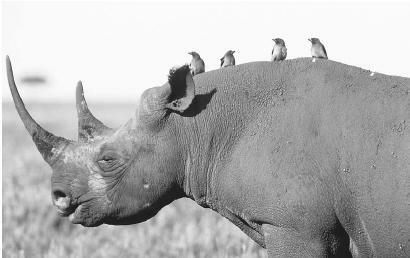 In this case I think I know who the rhino is — and I think the rhino has decided to use bug spray and get the birds off his back! For all the latest in 3DIC and advanced packaging stay linked to IFTLE…..
You are currently browsing the Insights From Leading Edge blog archives for September, 2012.